The theme for last night was “Jogging Suit.” At some point just before the event it was modified to “Joggng suit/Two-Piece Athletic Wear” for reasons that are a mystery. I happened to have a jogging suit so, the event was an easy prep. The suit itself is from KO Design and is nicely textured and shaded, given that it’s black with a white stripe. Doing all black clothing is difficult to do well and kallyfaith Rolland did an excellent job on this on. 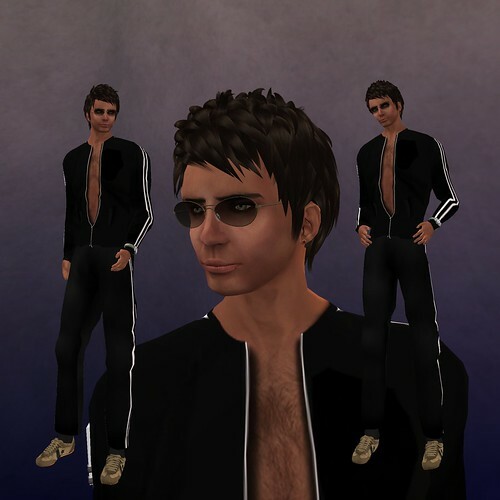 I added my best trainers – Horenbeek’s Black and Beige cross trainers to finish out the main outfit. The outfit needed some accessories so I added an aviator style watch from Aaron, my Bukka iPod, and a pair of primOptic Crowe sunglasses. I got my two votes. Matching shoes and outfit. The black and beige look ok to me, but all the winners had matching shoes. The poses were a bit problematic. There were a few line breaks that were particularly obvious given the open jacket. Posted on August 27, 2009, in Contests. Bookmark the permalink. Leave a comment.